I am in the middle of putting together an American Girl Felicity colonial party. I LOVE history and this party has been so fun to put together! 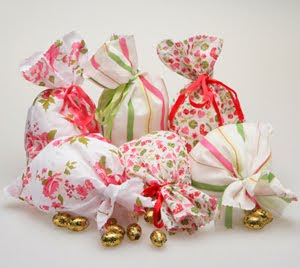 For the favor bags, I want to make fabric bags in period looking fabric. These bags I found at various UK and Australian sites have been a great inspiration. The favors consist of wooden dominos, wooden spinning top, wooden yo-yo, jacks and old fashioned candy sticks. I'm going to buy flour sack cloths at the dollar store, cut them in half and have the girls sew on a ribbon tie (sewing kit is also a favor) to make an apron to wear. I'm also going to make mob caps for them to wear during the party, teach them period dancing and games. Stay tuned for table settings! I've been putting together some little parties for her and I let her invite three of her friends so it's only a party for four. Less costly, easy clean up and yet fun enough to make memories. How has the rain been up your way. It's crazy down here. Did you hear that even Disneyland closed three hours early yesterday and Knott's Berry farm was closed all day due to the storm? cant wait to see everything!!! very cute-also, just saw your feature on design dazzle for your indiana jones party-congrats! I just love these little bags! 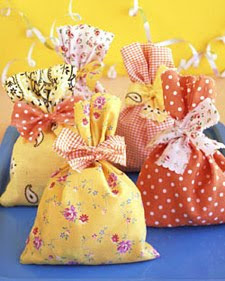 Fabric Favor Bags--very very cute! Hello darling Donna! 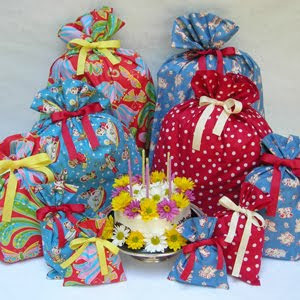 Love these party bags! You are one busy little bee! Good luck with this next "girlie" party! I am sure it will be a huge hit like all your others!